Garlic Mashed Cauliflower is an easy to make side dish that is rich and creamy, made with garlic, butter, parmesan cheese, and cream cheese. This is my husband's favorite cauliflower recipe, to date. I personally love, love, love roasted veggies, and 9 times out of 10 that's how I will prepare them. But, for some strange reason, he wasn't too keen on oven-roasted cauliflower. Crazy, I know. Alas, I aim to please, so I set out to find another way to prepare it. I decided to try mashed and I'm happy to say it was a hit! He loooooves garlic, so I knew a garlic mash was the way to go. There's also a little bit o' butter for richness, a touch of cream cheese for creaminess, and some parmesan cheese...for deliciousness! If you haven't tried cauliflower this way yet, I highly recommend it. I know a lot of people call mashed cauliflower the "mock" mashed potato, but I can totes tell the difference. I am a potato worshiper, so there really is no substitution for the real thing. But, that doesn't make mashed cauliflower any less fabulous in all of it's cruciferous glory! It's a light, healthy and absolutely delish side that would pair well with just about any protein. Set a stockpot of water to boil over high heat. Clean and cut cauliflower into small pieces. Cook in boiling water for about 6 minutes, or until well done. Drain well; do not let cool. In a small pan, saute the garlic in the olive oil until just cooked, about 2 minutes. 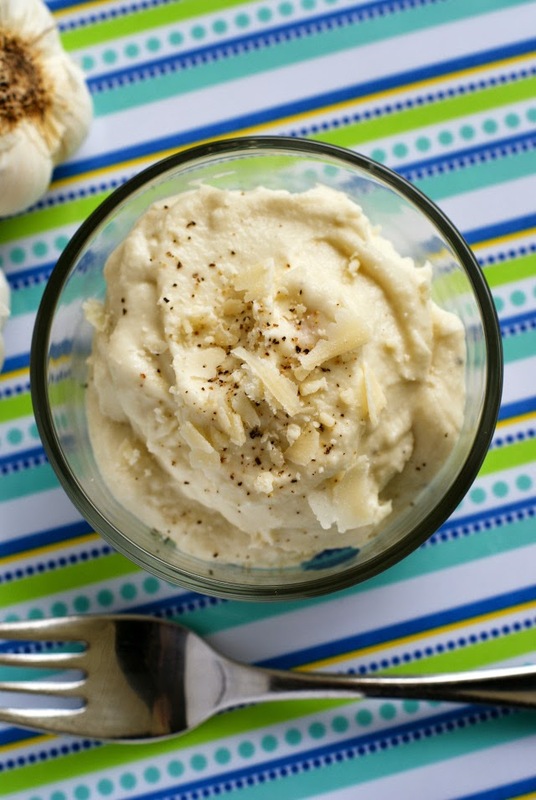 In a blender or in a food processor, puree the hot cauliflower with the cream cheese, butter, parmesan, garlic, salt, and pepper until smooth. Depending on how much you love garlic, you can increase or decrease the amount to your preference. For an added flavor boost, boil the cauliflower in chicken broth.